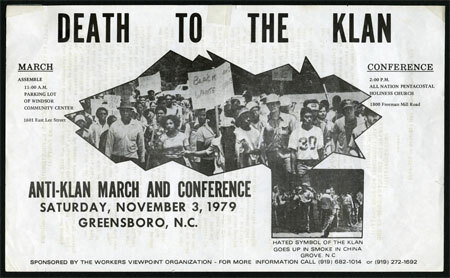 The "Death to the Klan" March, which took place in Greensboro in late 1979, involved a violent showdown between members of the Communist Workers Party (CWP), the Ku Klux Klan (KKK), and a neo-Nazi group. Similar clashes had occurred that year in April at Winston-Salem and in July at China Grove, although neither of them had resulted in gunfire. Before the confrontation, a leaflet campaign begun by the Workers Viewpoint Organization had intensified the hostility between the groups. An open letter described the KKK as "a bunch of two-bit cowards" and challenged the Klansmen to come to a "Death to the Klan" march and conference on 3 November, a Saturday. Only four police officers were assigned to accompany the demonstrators, as authorities assumed that a "low profile" would avoid trouble. However, because the parade was scheduled to start at noon, the police were not present when several vehicles packed with Klansmen arrived early. The shooting began at 11:23 a.m. and resulted in the death of five CWP members. The local media, in response to provocative CWP press conferences, were on the scene to cover the march; their reports and TV cameras provided a graphic record of the violence. Although the CWP and other groups characterized the episode as a "massacre," many Greensboro residents referred to it as a "shootout," thus blaming both sides. Despite the introduction of TV footage in the courtroom, the 1980 state trial of the KKK and Nazi Party assailants brought an acquittal from the local all-white jury. Three years later, following an extensive investigation by the Federal Bureau of Investigation (FBI) with the code name GREENKIL, a federal grand jury indicted nine of the KKK and Nazi suspects for conspiracy to violate the marchers' civil rights. The 1984 federal trial jury also found them not guilty. But in 1985 the CWP survivors won a $48 million civil suit against the KKK and Nazi Party, the Greensboro Police Department, the FBI, and the U.S. Bureau of Alcohol, Tobacco, and Firearms. In addition to allegations of assault against members of the KKK and Nazi Party, the suit charged the named law enforcement officers for negligence in the shooting, due to an FBI informant's foreknowledge of Klan and Nazi plans to arm themselves and confront the CWP marchers. Even this victory was muted, as the jury awarded only $400,000 of the $48 million requested and found only 7 of 65 individuals guilty as charged. The Greensboro police were heavily criticized for not doing more to avert the tragedy. The issue of race quickly became the center of the story, especially since the police apparently were unable to prevent the shootings, which had taken place in a black neighborhood. Afterward, several studies of human and race relations were undertaken to improve conditions and communications in the city. Many citizens believed that local officials were insensitive to civil rights. The official report stated that the "Death to the Klan" march had "clearly dispelled the notion that all was well in Greensboro's human relations." Later a Citizens Review Committee proposed 13 ways to improve race relations. Most of these were implemented in the early 1980s, particularly one that urged a greater police presence at confrontational events to ensure the safety of citizens. In the 2000s the Greensboro Truth and Reconciliation Commission was formed to continue fostering better race relations and community healing in the city in the aftermath of the 1979 tragedy. Paul C. Bermanzohn and Sally A. Bermanzohn, The True Story of the Greensboro Massacre (1980). Elizabeth Wheaton, Codename GREENKIL: The 1979 Greensboro Killings (1987). "Death to the Klan flyer, circa November 1979." Image courtesy of UNCG Libraries. Available from http://library.uncg.edu/dp/crg/item.aspx?i=1223 (accessed May 8, 2012). 1 January 2006 | Schutz, J. Christopher; Stoesen, Alexander R.